During the day, sometimes all the time you have to spare is 5 minutes. 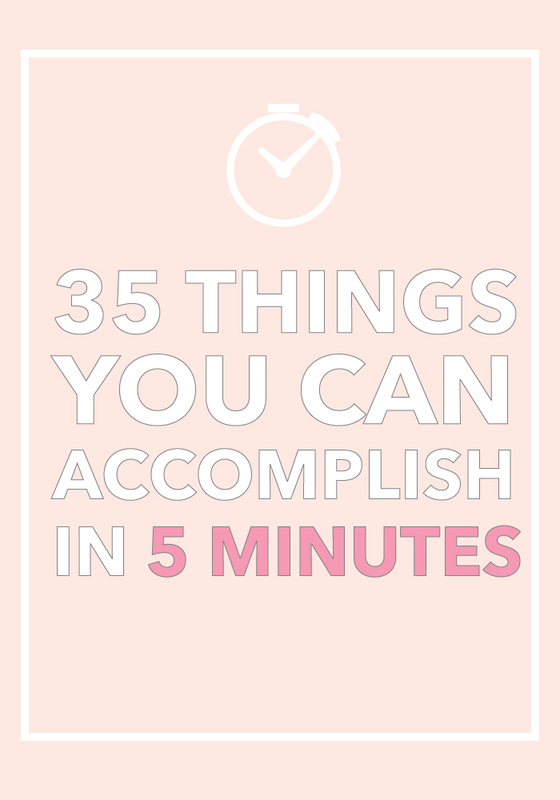 Here are 35 things you can do at work, home, or wherever when you have a few precious moments of down time! Make a list of things you need to do, a grocery list, places you'd like to go, books to read, people to call, favorites, etc. Make a list of all the lists you hope to one day make. Making a list is a great way to get organized quickly. I keep scratch paper at my desk during the day to write down thoughts or feelings or encouragements. It lets me get down the clutter in my head down on paper. Kara Haupt documents her note-writing with #karawroteherselfanote on Instagram. She even turned her notes into a book called 45 Pep Talks. Get up and get that blood flowing. Since I’m sitting at my desk nearly all day, it’s important to get up and get moving. It doesn’t matter where you go, just as long as you go. Go to the kitchen to get some water, go around the block, go to the restroom, go just around the floor in your building. There’s a ton of places you can take a quick jaunt to in 5 mins. Grab a small, healthy snack. Here’s what I find myself snacking on at work: Almonds + peanut butter, cut-up strawberries, half a banana + peanut butter, Lara Bars, Nourish snacks, apple slices, cuties, and Pop Chips. Don't know how? Try using Calm. You can pick the time, your favorite relaxing nature scene, and whether you'd like it to be guided or not. If you're not so much into that you can also try doing nothing for 2 minutes. Love this when I'm feeling sluggish midday! Take a scroll through instagram, check up on your tweets, repin a couple of things, stalk one person on Facebook. Then, remember to put it away! It doesn’t hurt to start a good vitamin regiment now. Take a few seconds and put some good into your body for lasting energy and overall health. Get rid of lingering receipts, throw out old pens and makeup products, collect loose change, and put other things away into pockets. I guarantee you already feel more sane! Reapply lipstick or lipgloss, fix winged liner, and blot oily zones on your face. There! You’re good as new. Sometimes it’s just nice to have a little change midday, especially if my hair isn’t particularly thrilling. Go from wearing your hair down to an artfully crafted bun. Go from a messy bun to a fun braid. Pin back your bangs in a braid or twist. Throw on a a fun headband. Keep a hair tie and some bobby pins your bag and there’s so many simple styles you can achieve in under 5! Take a minute to clear away and organize files on your desktop. Try deleting apps that you don’t use and organizing the rest. Set up Carousel to automatically declutter your phone’s photos. If you can’t spare time to walk around, try a few basic stretches. Get blood flowing and stay energized by trying these moves. I’m always happy when I take the time to get in touch with someone I’ve been meaning to. Say hey to your friends who you don’t get to see too often. Good things always seem to come from this small act of reaching out! Use unroll.me to unsubscribe from unwanted email lists and newsletters. There’s no such thing as paying a bill too early after all. For some reason this task is unpleasant to me and I often find myself putting it off. However, it definitely needs to get done. Set 5 minutes and see if you can beat the clock. Bet this chore will take half the amount of time it actually feels like it takes. 1 cup nut milk, 1/3 cup chia seeds, 1tbsp of vanilla extract, sweeter of choice (agave, stevia, honey, maple syrup, etc) to taste. BAM. Throw in the fridge for at least 1 hour or until thick and enjoy. Make a quick cocktail (if you’re at home) or a quick mock tail (if you’re at work)! Stick to tried and true favorites with simple ingredients and maybe only 1-3 steps. If you’re lacking inspiration, collect some here! Grab a microfiber cloth and make your lens to the world fresh and clean again! It’s a quick change bound to brighten up your day. Grab seriously lovely wallpaper freebies from Design Love Fest’s “Dress Your Tech” series. grab a glass of water or refill your current one. Try investing in a good water bottle so you can be environmentally friendly and get more water in one sitting than a glass will provide. It never hurts to always be thinking and planning ahead. So many emails, too little time. Take 5 minutes to quickly answer a few low priority emails. Save time in your inbox by utilizing Google’s filters. They have seriously saved me so much time and pain-staking organization. Here’s how to use them. Prime time to text your significant other or friends and figure out dinner plans ahead of time. I know I’m not the only one who comes home from work and plays the “what are we going to have for dinner tonight?” game. Just by putting down your positive vibes I guarantee you’ll feel a lot better. Plus this little list can help you identify gratitude and seek out positivity in even the smallest of actions. If it helps, you could also vent your frustrations in an opposing list (but make sure you do the “happy list” no matter what). Call in your lunch order or do it via the web. I love how much time it saves me when I call ahead for my lunch. All I have to do is pick it up and not waste precious minutes of my lunch break standing in line or at the drive thru waiting to order. If your city has access to a delivery service like Seamless you could always utilize that. If you're in Northwest Arkansas like me, you could try Chef Shuttle, CHEW Wagon, or an up and coming service called TapItDelivery! Keep your planner up to date. Things change - make sure you're all up to date! Being informed is never out of style. Catch up on what’s going on in the world via a service like The Skimm. Like every good yogi knows, the power of your breath is essential. I always keep saying that I’m going to print more photos. Take 5 minutes, log onto wherever you like to print your pics, and just do it. Utilize PostalPix, Social Print Studio, or Sticky9 from your phone to get photos delivered to your doorstep. You could also just try using a local store. Order online and pick up on your way home from work. Easy peasy. I know Walgreens usually has great photo deals. Being nice never goes out of style. Remember to be genuine! The littlest encouragement can brighten someone's day exponentially. It feels like an unnecessary chore because you’re just going to mess it up again later, right? I totally understand. However, I always feel better coming home to a freshly made bed. It makes me feel really put together. Though it may feel like a throwback to your Junior High self (did anyone else make mixes to burn to CD's? ), don't ever estimate the power of a really good playlist. Download Spotify and get to it! Wipe down your desk, the counters, or anything else that hasn't been thoroughly sanitized in a while. Slather on some yummy smelling antibacterial. Doing this every now again in the down time will help cut down on the # of times you get sick this year. What are some things you find yourself doing when you have 5 minutes to spare? Let me know! I REALLY need to work on #21! Saving this list :) also, your blog is looking so fabulous!! So glad to hear that! Unroll me is amazing. I try to utilize it every few months just to keep down the number of newsletters I subscribe to!